You really can’t go wrong with a visit to one of the Mediterranean’s finest island-destinations. Sardinia has it all: a proud and unique local identity, a rich cuisine, stunning beaches, and dramatic natural scenery both above ground and deep beneath the limestone surface. Whether you’re a coupling seeking a mix of adventure and romance or a family traveling with children – Sardinia will not disappoint. 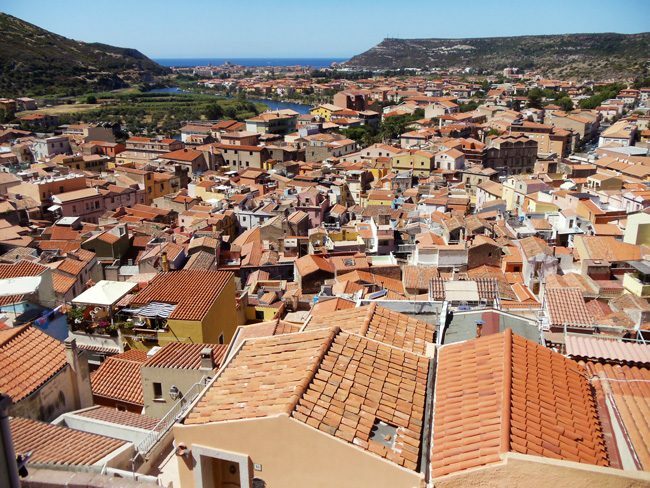 This 7 days in Sardinia sample itinerary covers a late-August couple’s trip spent exploring both the east and west coasts of Sardinia. Sardinia ain’t your typical Italian destination. The second largest island in the Mediterranean is an autonomous region in Italy and one of the most geologically ancient land masses in Europe. The island was populated in various waves of immigration from pre history until recent times, occupied by the likes of Phoenicians, Romans, Byzantines, and Moors. But it were the Catalans of Aragon and later the Spanish who heavily influences Sardinia, leaving their mark until this very day. 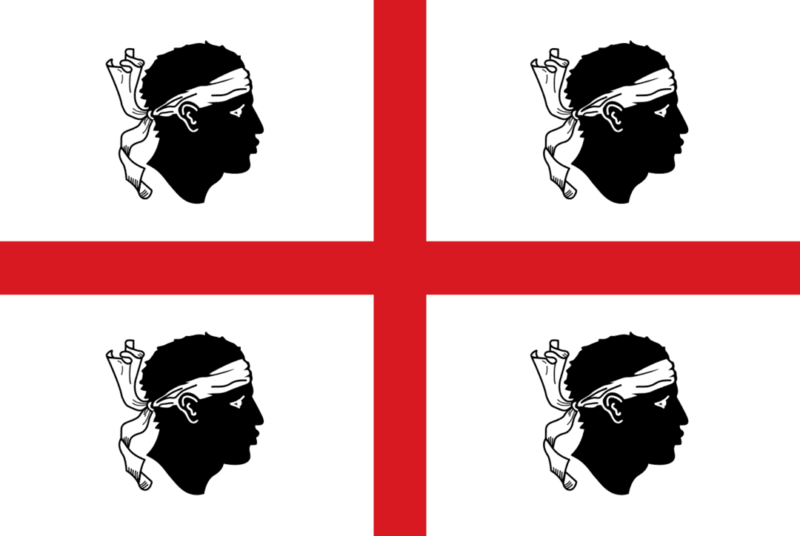 In Sardinia, indigenous languages are spoken in parallel to Italian and the Sardinian flag is proudly displayed from just about everywhere. 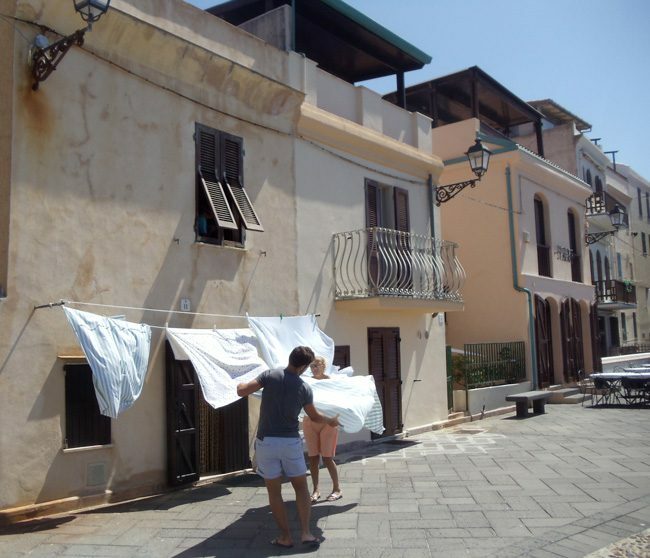 These days, the island’s major sources of income are tourism and agriculture, with the summer months being the time of mass migration of domestic Italian tourists from the mainland. Summer is also a time of festivals in Sardinia and these always involve a lot of local culture and food. 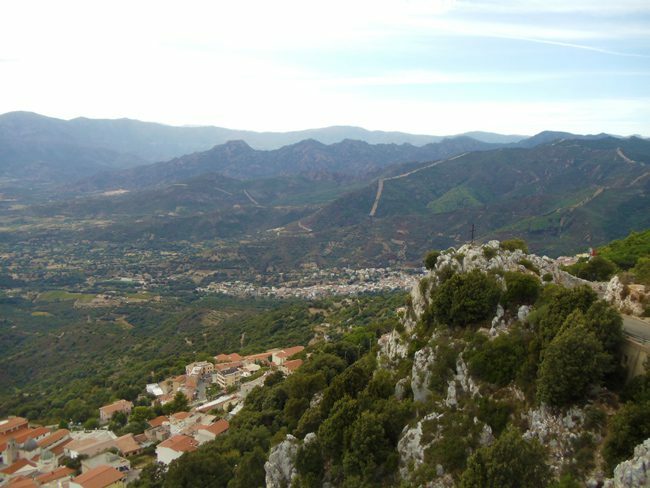 Though you can reach Sardinia by ferry from a number of ports in France, but mainly in Italy, flights from your home country will largely determine the part of the island you’ll focus on during a week in Sardinia. Unless the purpose of your trip is to fully explore the island, I recommend taking things slowly, catch some sun at the beach, and enjoy la dolce vita. 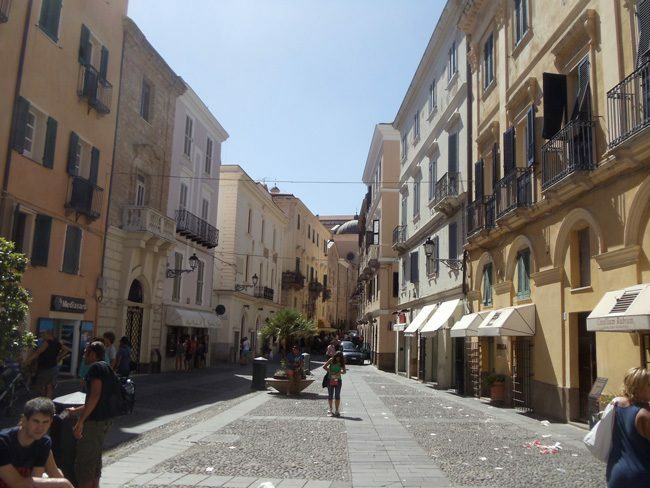 Both Alghero and Cagliari are attractive cities to base yourself at for the first few nights. Cagliari is the largest city on the island and quite Italian in feel. The walled city of Alghero, on the other hand, is a lot smaller, close to excellent beaches that are suitable for day trips, and fully geared for tourists. 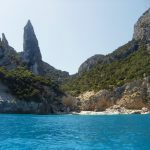 This particular sample itinerary for 7 days in Sardinia is based on arrival by plane to Alghero and largely excludes overpriced Costa Smeralda in favor of the Gulf of Orosei. 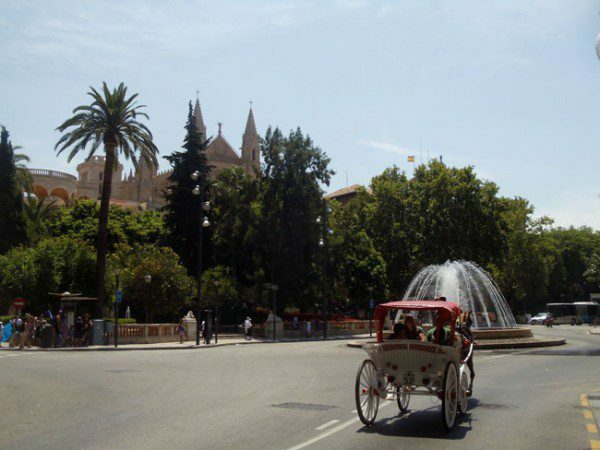 If landing in Cagliari, simply swap the Alghero days for sightseeing in and around Cagliari. 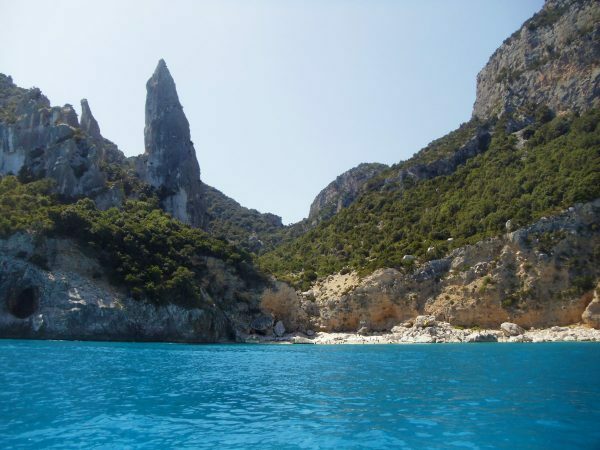 What’s Included in this 7 days in Sardinia Sample Itinerary? 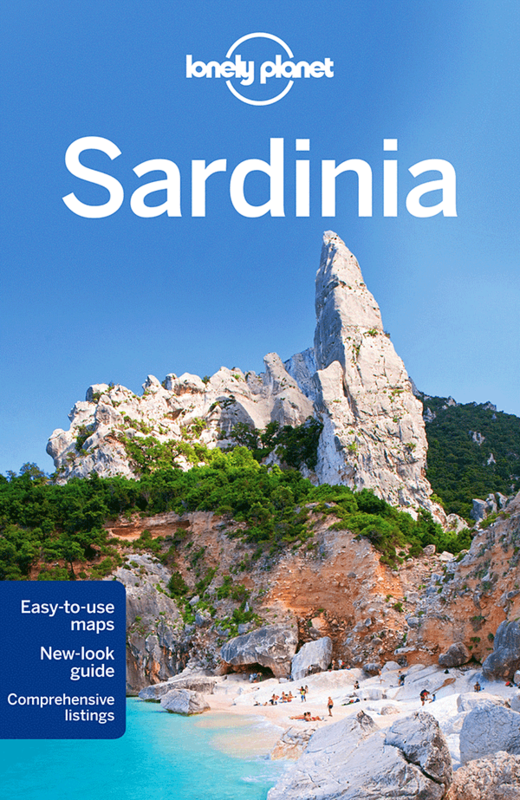 Pick up your own copy of the Lonely Planet Guide to Sardinia, a comprehensive travel guide book to the island. Together with this Sardinia itinerary, you’ll be fully prepared for your trip, have a handy hard-copy reference, and be able to brush up on the interesting island history and culture. Sardinia isn’t a huge island but it is big enough and interesting enough to warrant taking things slowly. Don’t rush, pick an area or two to concentrate on during a week’s vacation (like we did in this itinerary), and leave plenty of time for beach and relaxation. 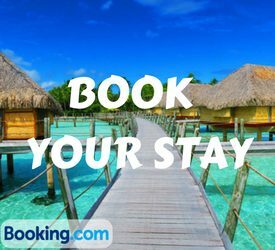 If you’re visiting during peak tourist season, it’s highly recommended to book accommodations well in advance, especially if you’re picky on sea view, location etc. Sardinia or Mallorca? 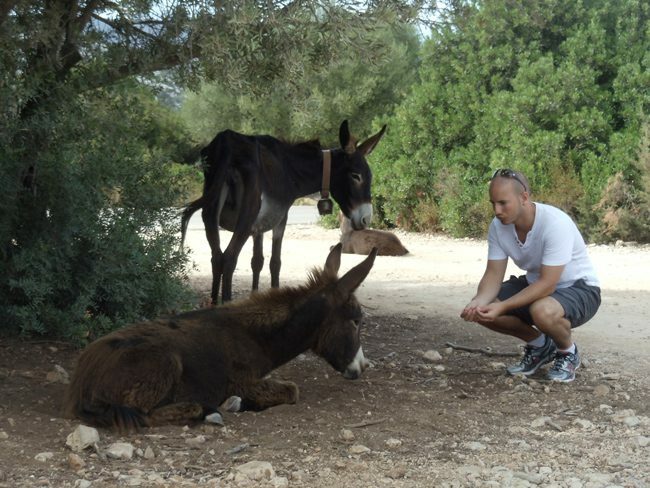 That is a tough question as we absolutely loved our memorable vacation in Mallorca. I personally found both islands to be very similar, with Mallorca having a slight edge when it comes to a selection of small towns and the delights that come with them (markets, town squares etc.) 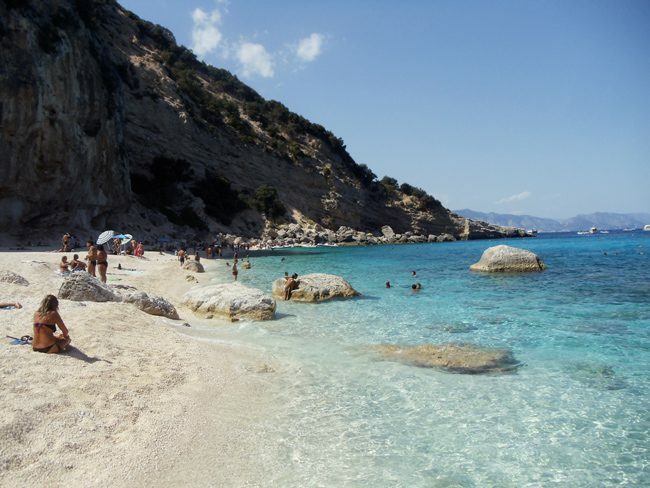 and Sardinia having a slight edge when it comes to beaches. Another aspect to take into account is the food and whether you fancy Spanish over Italian cuisine. Renting a car for all or part of your trip is highly recommended and rates are inexpensive. Alghero can also be reached from the airport by bus, which drops you off at the marina side of Via Sassari just outside the entrance to the old town (~20 mins). 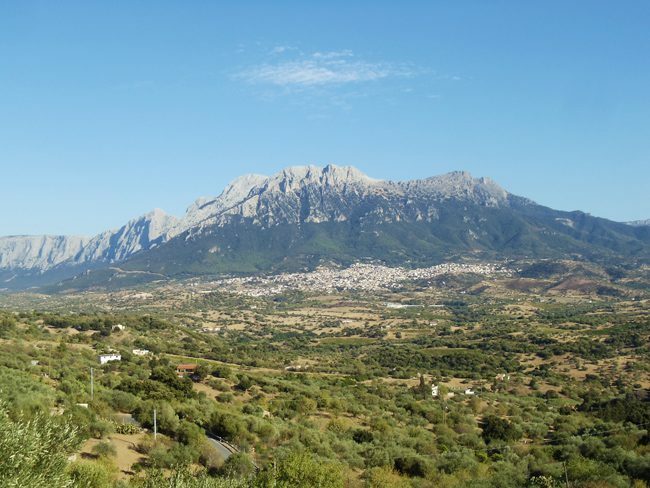 Driving in Sardinia is quite easy and well-maintained highways link the island’s most populated centers. For scenic road trips, however, consider taking the mountain roads but do keep in mind that due to their nature, they add a considerable amount of time. Do not leave anything visible in the car, especially when parking at the beach or in nature. There have been cases of tourists having their car broken into. We found Sardinia to be relatively inexpensive compared to other European summer gateways that we made it to over the years. This was largely due to basing ourselves in Alghero for the first few days and completely skipping the posh Costa Smeralda, where we heard rumors of water bottles going for as high as 15€. 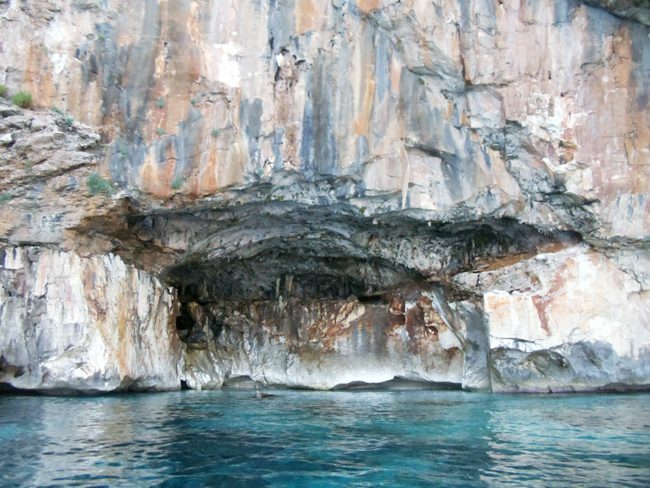 Sardinia does have a few decent diving sites including a few wreck dives and underwater caves. If that’s your thing, don’t forget your diving card. Not diving? Not a problem. 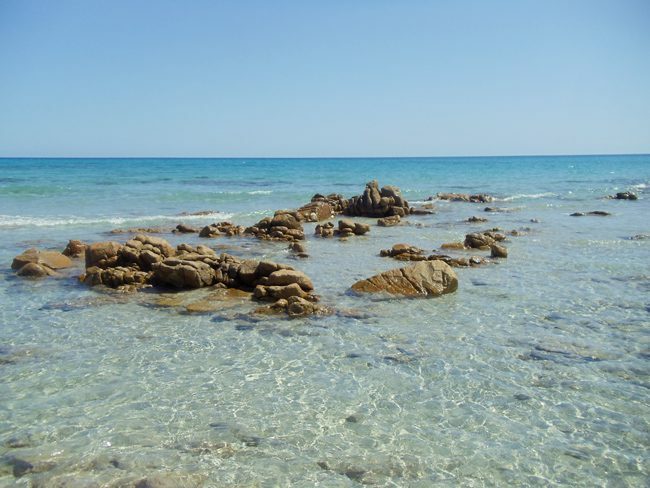 Be sure to have your own snorkeling gear with you as some of Sardinia’s beaches are also attractive beneath the waves. 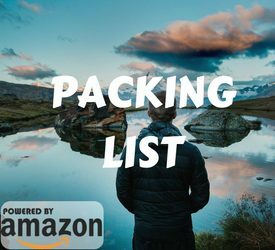 Have a look at the X Days In Y Packing List for clothing and apparel ideas. I recommend bringing (or buy) light picnic equipment such as an insulated cooler bag, ice packs, and small plastic boxes. In a lot of Sardinia beaches you won’t have the opportunity to purchase food and, in any case, a picnic lunch at the beach is always a great idea. In north Sardinia, you’ll find as many Sisa supermarkets as you would find 7-11’s in Bangkok so stop here at the start of every day and stock up. There’s lots to bring home with your from Sardinia in the form of liquid (wine, olive oil etc) so be sure to pay for checked luggage, at least for the return leg back home. 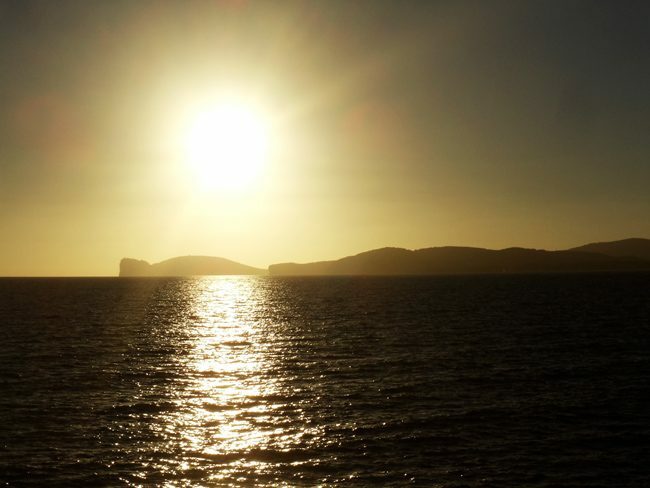 We’ll spend the first two days of the week in Sardinia in and around the charming city of Alghero. This once strategic port city is now north Sardinia’s main tourist town, north of which are a few fine beaches worthy of a day trip. Pro tip: Alghero’s walled historic center is where you’ll find most of the city’s top sights, drinking and dining options, and charm. However, take note that parking can be quite tricky in Alghero with only residents allowed to even enter the old city with a motor vehicle. Therefore, if staying inside the old city, you might need to park the car in the large parking lot by the marina but it’s best to check with your hosts. Personally, we stayed at B&B Valencia, a charming bed and breakfast is just a 10-minute walk south of the historic center. 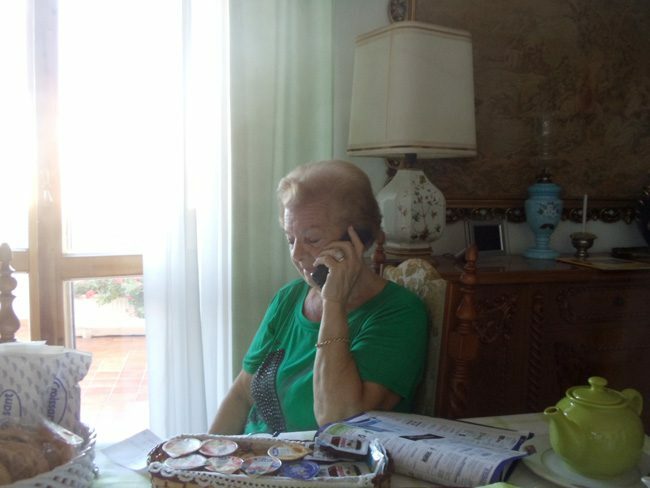 At the time of our stay, it was owned and operated by an incredible senior citizen named Teresa. 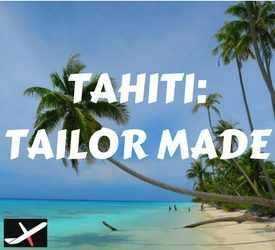 She went out of her way to make us feel welcome and provided us with some of the travel tips shared with you in this itinerary. 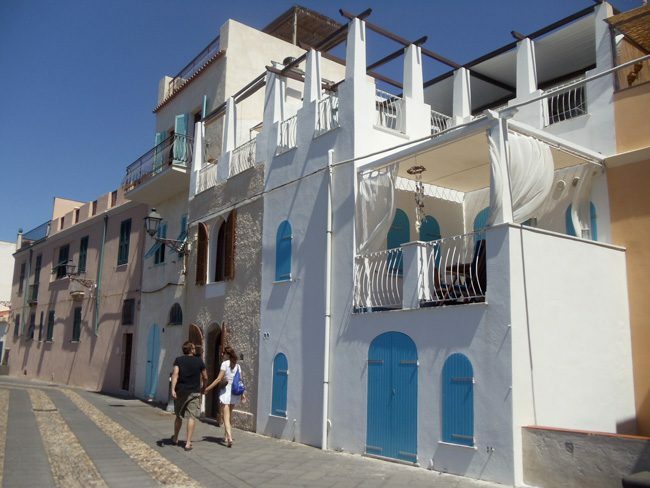 The B&B is located at the top floor of an ordinary-looking apartment building with large and cozy old-fashioned rooms. The best part is the huge sea-facing outdoor terrace where you’ll enjoy both breakfasts and sunsets. Despite the 1940’s decor, the WiFi was great and the stroll to town was a pleasant activity on its own. On our return leg to Alghero, B&B Valencia was sold out so we stayed Lu Palau de Antoni about a 15-minute walk north of the old city. It was quite a bargain considering Alghero was in short supply of accommodations during those dates, kind of a cross between an Airbnb and a high-end hostel. 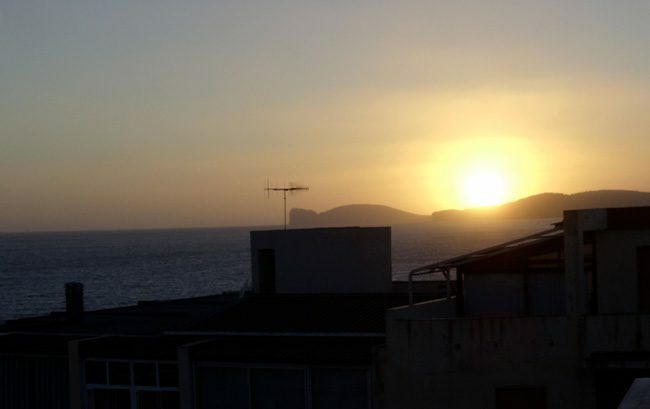 Here’s a list of all Alghero accommodations that you can book online! 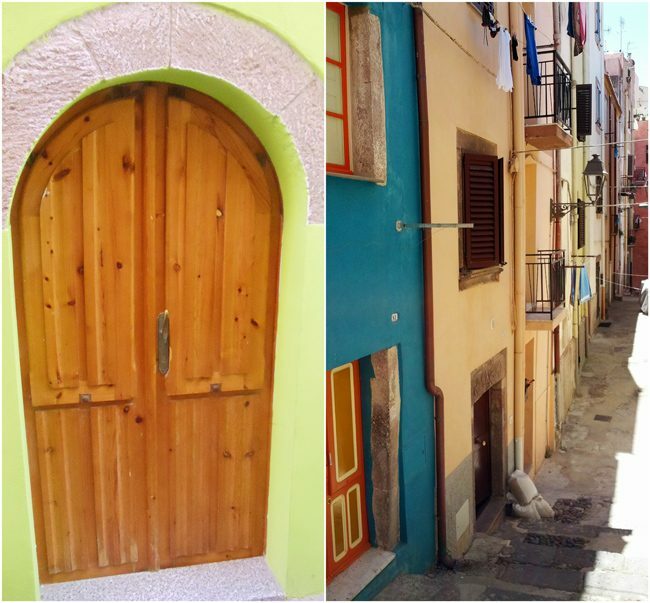 The first day in Sardinia will focus on Alghero, mainly on its historic walled old city where narrow alleys lead to animated piazzas lined with cafes, shops, and restaurants. Alghero’s Spanish influence – dating back to a 14th-century Catalan invasion – is evident just about everywhere you set foot in the old city. The strategic port city and fishing hub also played a role in WWII, with Alghero suffering extensive damage from bombing campaigns. 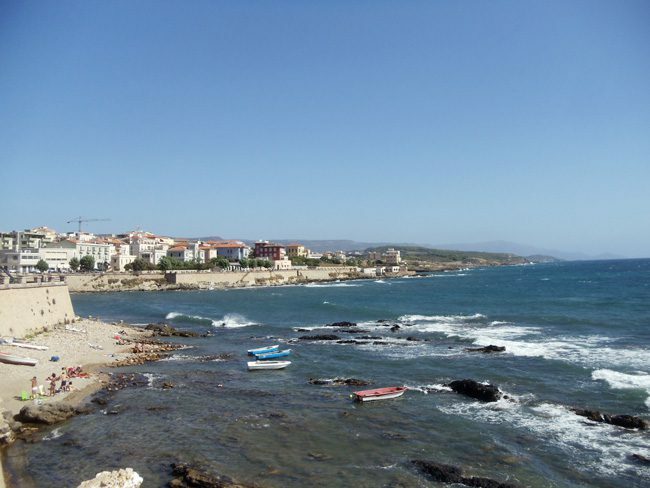 These days, Alghero is famous for fresh seafood, red-coral jewelry, and large amounts of visitors. 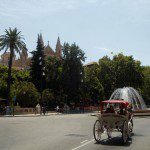 Pro tip: it really doesn’t matter in which order you do the following but here’s how we explored the old city of Alghero seeing how we were based south of the old city at B&B Valencia. 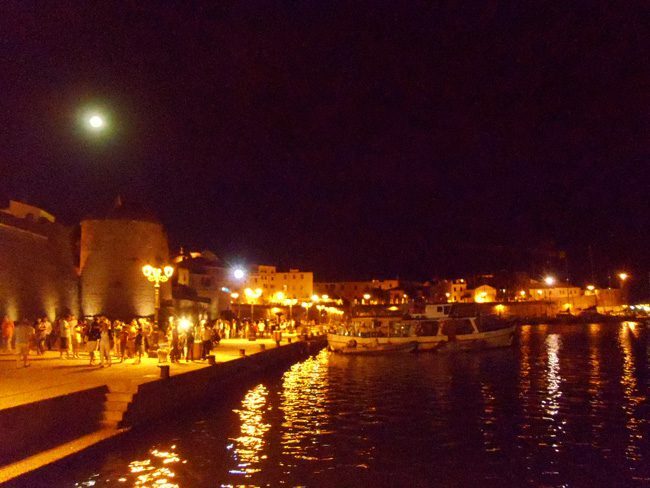 Start your walking tour of Alghero on the seaside, first by walking along Lungomare Dante to the Torre Sulis. We’ll come back here at night when the scene is quite lively but during the day time, treat yourself to sweeping views of the old city and of hidden coves where local fishermen like to chill between outings. 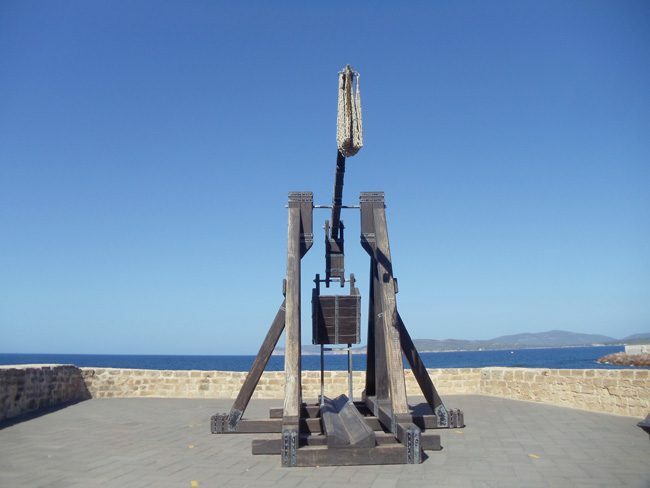 Enter the old city at Bastioni Marco Polo, walk along the ancient ramparts and check out the replica of a catapult depicting the war toys used in the past to defend the old city. This area is also a prime sunset viewing spot and boasts a handful of romantic restaurants, one of which we’ll dine in tomorrow. Use this opportunity to check out the menus and to make reservations. You can technically walk on the ramparts and turn the corner towards the marina, but instead, cut into the alleys of the old city and find the steps leading down to the marina via Porta a Mare – one of the old city’s remaining main gates. 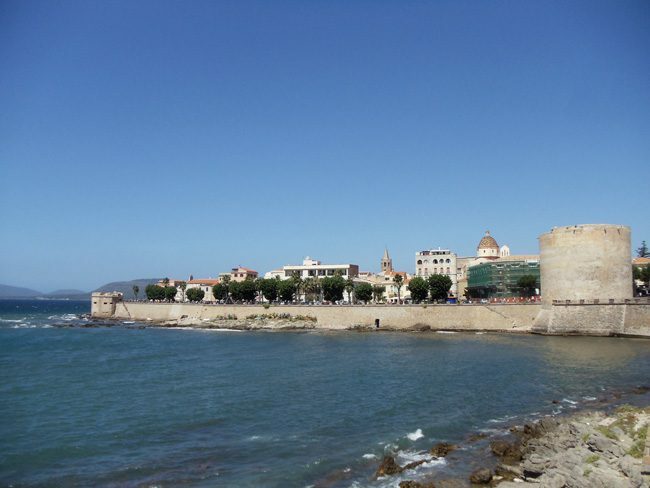 Alghero’s marina is dominated on one end by the imposing Bastione della Maddalena (old fort). Aside from a parking spot for yachts and tour boats, the marina serves as a post-sunset gathering place, where the old city ends and the new Alghero begins. For lunch, head to Bar Focacceria Miles and devour a delicious focaccia-bread with whatever toppings you fancy. It’s not only delicious but also quite cheap and frequented by locals. 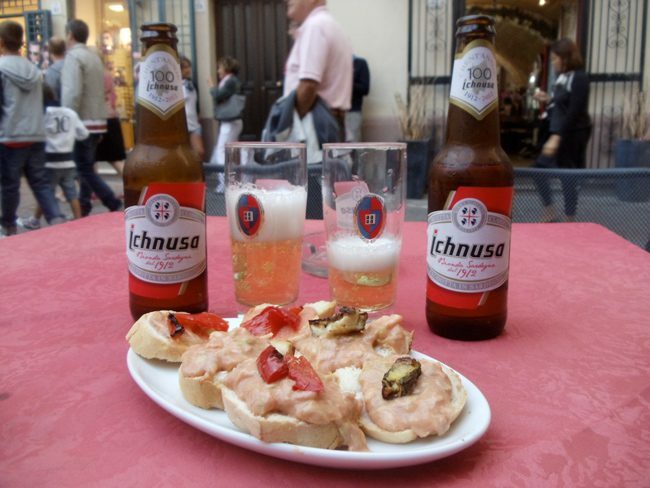 Oh, and don’t forget to wash everything down with a glass of the local brew – Ichnusa Beer. 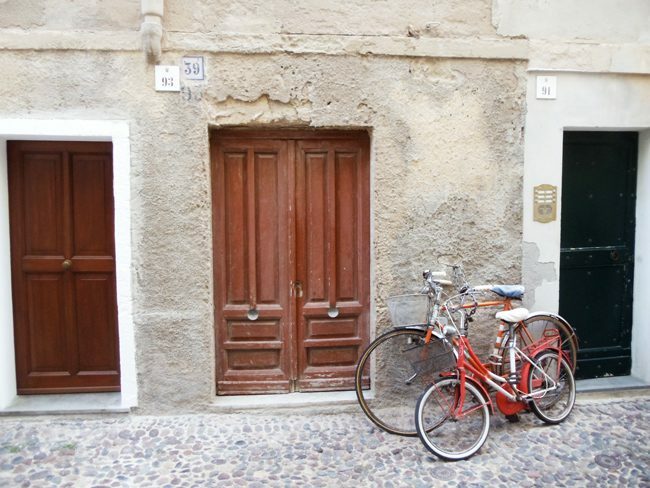 Re-enter the walled city from Porta Terra – one of its original main entrances – and walk along Via Roma – one of the old city’s three “main shopping streets” together with Via Carlo Alberto and Via Gilbert Ferret. Pay a visit to Enodolciaria on Via Simon 24 and browse through their impressive selection of local wine, liquor (limoncello anyone? 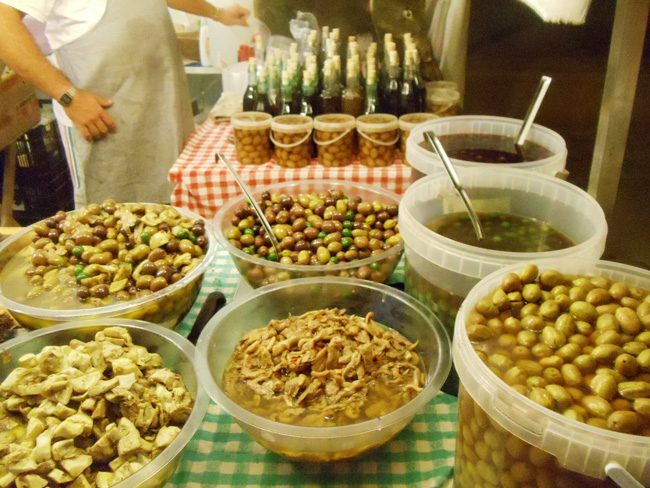 ), olive oil, vinegar, pasta, sweets and other Italian delights. 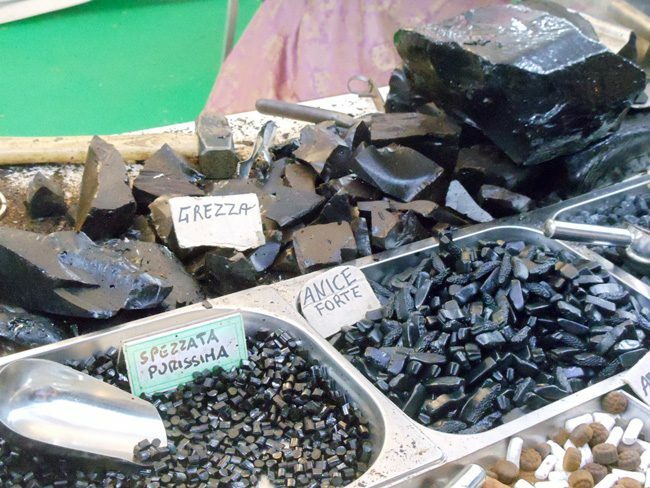 Buy some now or get ideas for the return leg to Alghero at the tail end of the trip. Pause for a quick break at Piazza Municipio and check out Cattedrale di Santa Maria (Cathedral of St. Mary the Immaculate) – Alghero’s main cathedral. 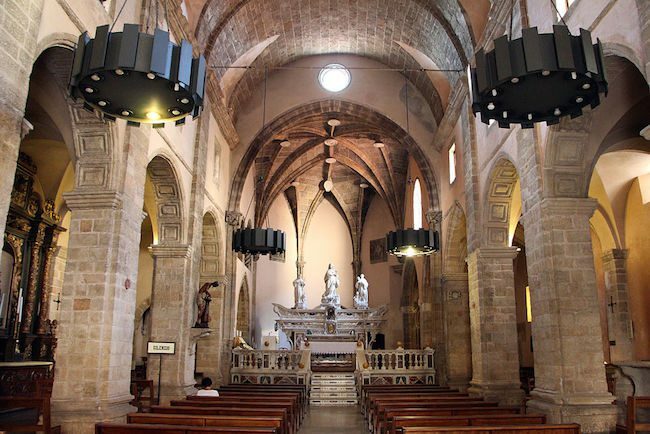 Originally built in the 16th-century, the cathedral draws its looks from the changing powers that reigned over Alghero, from the gothic to the Catalan to the Italian. From here, detour to Piazza Civica – the old city’s main square – for a shot of caffeine or more souvenir browsing (don’t forget to pick up some red-coral jewelry – an Alghero specialty). Eventually, find your way through the maze of narrow lanes to the Chiesa di San Francesco – a 14th-century cathedral whose exterior may not look so impressive but its interior sure is. Continue your walking tour of Alghero and start looking up to spot the colorful tiled-dome of the Chiesa di San Michele. If you’re up for seeing another ancient tower, check the nearby Torre di San Giovanni (Tower of St John), though it’s really not a must. 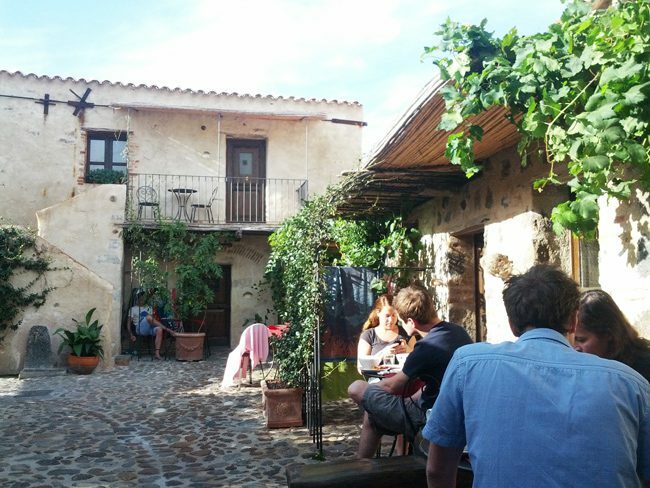 Before exiting the old city in preparation for dinner, pay a visit to L’altra Isola on Via Maiorca 107. This is another shop worth visiting, with a great selection of locally-made and high-quality ceramics, jewelry, hand woven goods and lots more. With all that walking and browsing, it’s time to treat yourself to some ice cream! Grab a seat on the outdoor terrace of Cafe Girasol and concentrate, because choosing which sundae to order will be mighty hard. Enjoy your sweet gelato over the last few rays of sun with awesome views of the ancient bastion and the Mediterranean. 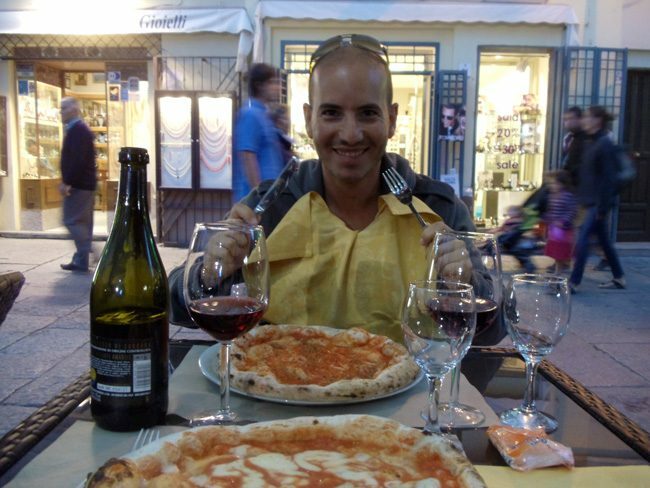 For our first dinner in Alghero, we headed to Regina Margherita in Piazza Sventramento to enjoy some more of that dolce vita. Any piazza you’ll find your way to will be a rewarding experience and prices are surprisingly not that expensive despite this area’s appeal to tourists. Though we had to wait in line for a while (it’s wise to make dinner reservations), we paid less than 30€ for a starter, two pizzas and a bottle of Lambrusco. Not wanting this incredible first day to end, we headed back to the marina and walked along the seafront boardwalk that runs along Via Giuseppe Garibaldi. 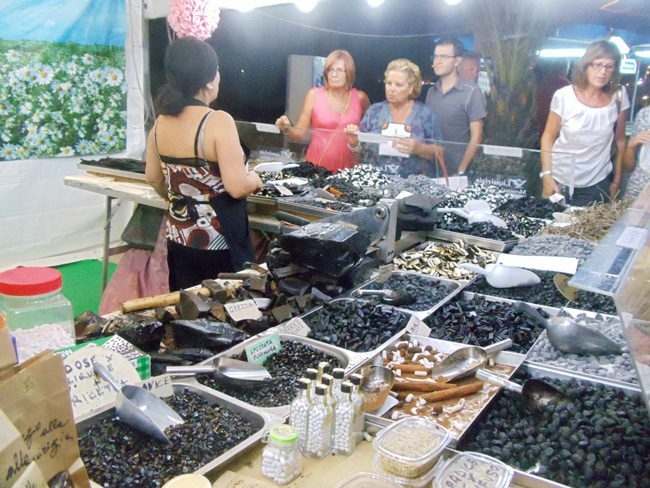 During the summer months, this place really comes to life at night with locals and Italian tourists dancing away to karaoke tunes and rows of local stalls displaying crafts and Italian delights for sale such as olive oil and black licorice (my favorite). We devoted day two of our 7 days in Sardinia to the beach. I’ll recommend a few options but, in any case, I advise stopping at the local supermarket before leaving town to prepare a picnic lunch for the beach. This is the easiest option and perhaps the most convenient if you’re traveling with children and don’t have a car. San Giovanni Beach is Alghero’s city beach and it’s just north of the marina. It doesn’t rank among the island’s top beaches but it does boast a very long stretch of sand and close proximity to the comforts of the city. 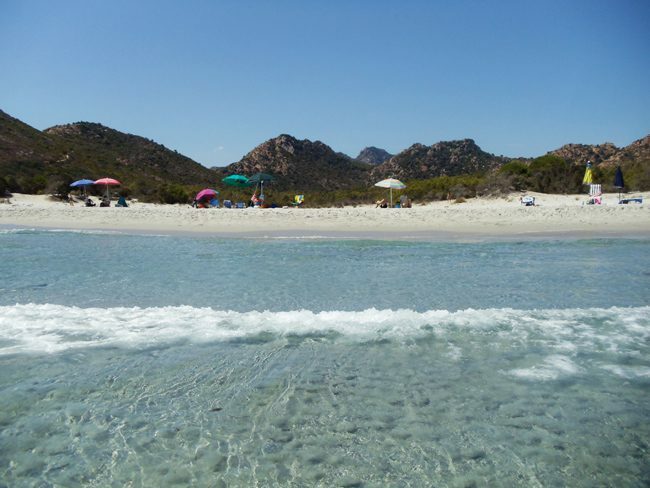 If you have a car, head to Spiaggia La Pelosa – one of Sardinia’s most famous beaches. The beach is more like a South Pacific lagoon, with clear shallow waters and soft white sand. It’s quite a popular beach, especially with Italian holidaymakers, but if you arrive early enough in the day you should be able to find a spot to call your own. Reachable by public transportation from Alghero, Spiaggia del Lazzaretto was our preferred choice seeing as we only rented a car starting from day three. Getting here is quite easy, just take the bus from Alghero’s main park on the north side of Via Sassari. Drivers likely won’t speak English but just mention the name of the beach and you’ll be fine. The ride should cost less than 1€ and take about 30 minutes to reach the beach. The main beach has a small cafe but it can get quite crowded in the summer months. Instead, walk along the shoreline, climb over a few bluffs and find yourself a small cove where there’s still some space left. 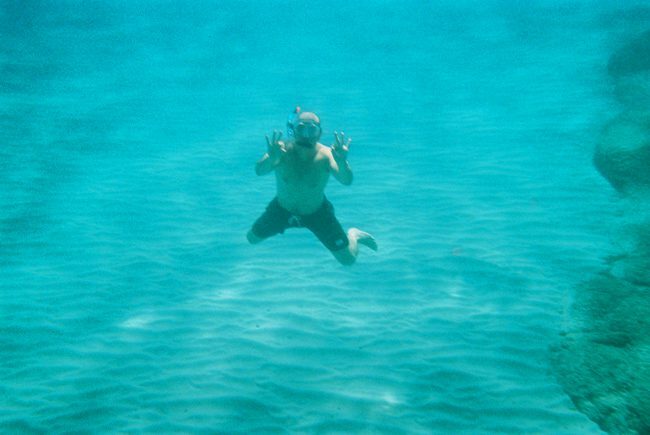 The water is super clear and shallow, perfect for some snorkeling so don’t forget your gear. After a day at the beach, it’s back to Alghero to cool off with some ice cream and a pre-dinner afternoon nap. Head to Gelateria K2 on Via Roma 73 for the best Italian ice cream in Alghero. This award-winning ice cream maker is known (and loved) by all locals, and don’t miss out on tasting their pistachio flavor – by far my personal favorite! For a romantic dinner, it’s wise to make reservations either the day before or in the morning before leaving for the beach. 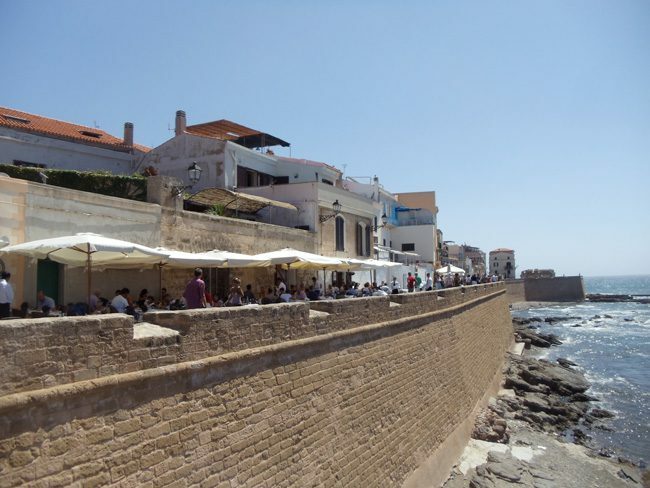 We headed to Bastioni Marco Polo on the western rampart of the old city (by the catapult) where you’ll find a selection of good restaurants not mention great sunset views. Our dinner at Osteria Macchiavello was OK considering the touristy location, quite expensive but the meat and pasta were great. It was here that we made acquaintance with our favorite brand of local olive oil – Sartore – which we ended up buying a few bottles to take back home with us. If you still have some gas left in the tank, walk along Lungomare Dante just south of the old city. Unlike Via Giuseppe Garibaldi, which we explored last night, the nightlife scene here is more popular with the younger local crowd. 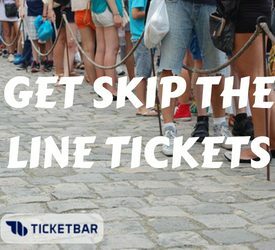 Along with lots of live acts playing in the street, you’ll find a good selection of cool little bars with impromptu outdoor seating areas. 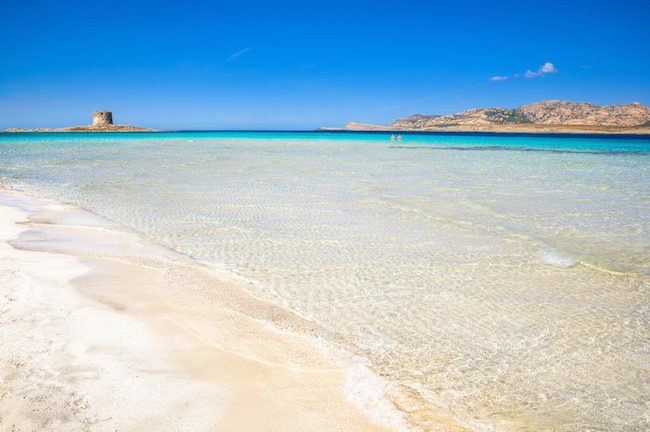 For the next three days of this week in Sardinia itinerary, we’ll explore the perfect beaches of the Gulf of Orosei and spend a full day in the mountains. Day four of our 7 days in Sardinia is all about beach relaxation. Post breakfast, head to the local Sisa supermarket and prepare a picnic lunch along with snacks and drinks for the day. 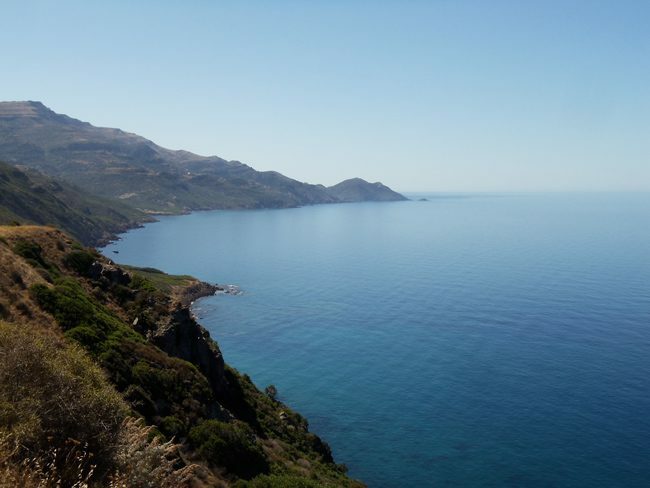 At the recommendation of our hosts, we headed to Bidderosa Beach – about a 30-minute drive from Orosei. The beach is part of a national park where visitor numbers are restricted. It’s first come first serve around here, ensuring the beach isn’t overcrowded but also forcing a relatively early start to the day (small entry fee is required). If you’ve managed to get in, follow the dirt road shaded by endless rows of pine trees until you make it to the beach. The road keeps veering north and the rule of thumb is the further you drive, the fewer people you’ll need to share the beach with. 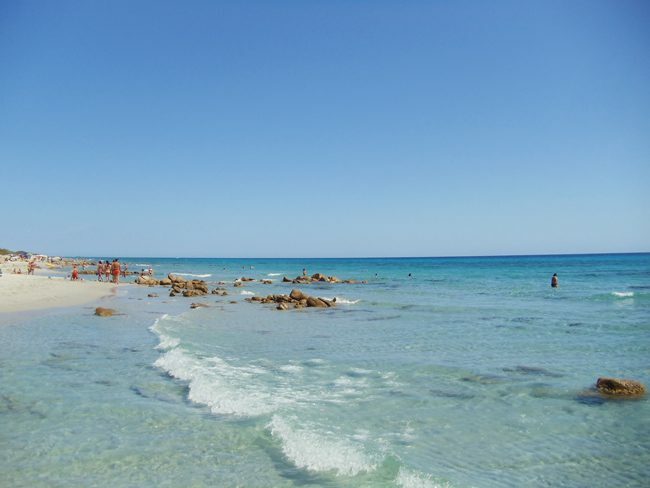 The series of beaches in Bidderosa are absolutely remarkable, blanketed by soft white sand and chilled by crystal clear shallow waters. 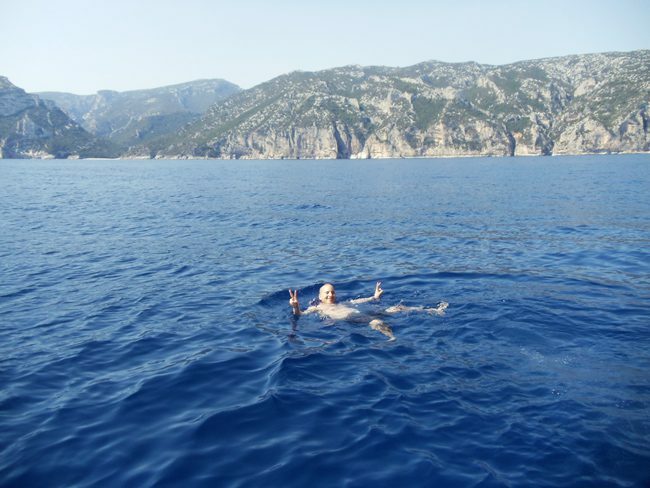 Snorkeling isn’t great but still a fun activity to break the routine between tanning, eating, snoozing, and reading. Pro tip: you can walk from one beach to another and there’s even a small kiosk in one of them. Therefore, it’s wise to base yourself in the further beaches of the north and walk south when you feel like stretching your legs. Tonight’s evening activity is pretty much like yesterday’s. Head to the center of the village and dine wherever you feel like it, perhaps going for pizza this time. Tomorrow’s last dinner in Orosei will be a special one. This is by far the most exciting day of the week spent in Sardinia so make sure the spirits are high and to get a good night’s sleep. On this day, we’ll visit a number of spectacular beaches in the Gulf of Orosei. Reaching some of these beaches is technically possible by hiking but, in large parts, they are only accessible by boat. The best way to enjoy this memorable day is to hire a small motorboat and do some beach hopping at your own pace. You can rent a boat from Oltramare in the Orosei marina for about 100€ per day (not including gas) and no license is required. The folks will show you the ropes of how to operate the boat, the rules of the way when it comes to anchoring, and what to do in case of choppy waters (can happen on the cruise back to the marina). 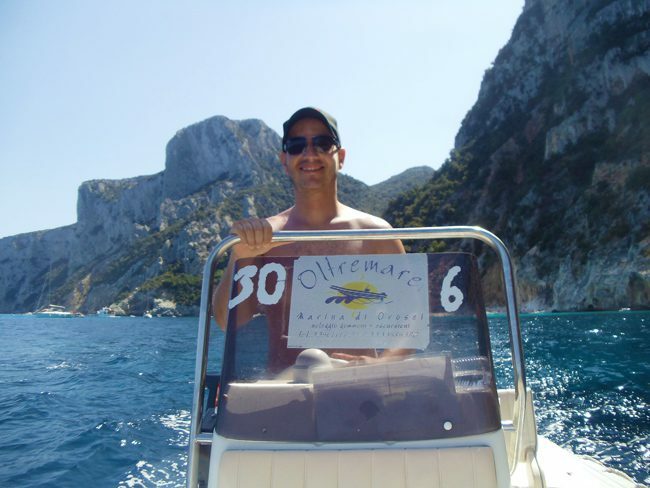 If you do not feel comfortable renting your own boat, many outfits in Orosei but more so in Cala Gonone will be happy to take you to the various beaches on private tours, shared tours or on large boats to Cala Luna (shared with hordes of tourists). Pro tip: to beat the summer crowds, it’s best to get an early start. Don’t forget to bring a picnic lunch, snacks, lots of water, sun protection, beach and snorkel gear. The stretch of coastline curving from Cala Gonone south to the tip of the Orosei Gulf is home to a number of world-class beaches. It is here that sharp limestone pinnacles from the Gennargentu Mountains meet the Mediterranean, leaving thin slivers of sand and caverns in hidden coves for the intrepid traveler to enjoy. Sculpted over the course of millennia in unique fashion, each beach is awarded with its own personality and shade of sand. Out here, It’s not only the time spent on the beach that’s memorable but also the way, as cruisers are awarded with panoramic views of the landscape and hikers with amphitheater views from atop. Pro tip: it is recommended to make your first stop the furthest beach you plan to reach at the southern end of the gulf and to work your way back to the marina as you anchor in additional beaches. The southernmost beach in the gulf is the most impressive one and your first stop on this beach hopping journey. Cala Goloritze’s thin sliver of powdery white sand is dwarfed by the iconic 148m-high limestone pinnacle known as Aguglia. It is an imposing scene when viewed from the gulf and you’ll want to “park it” for a while to digest the views before heading to the actual beach. 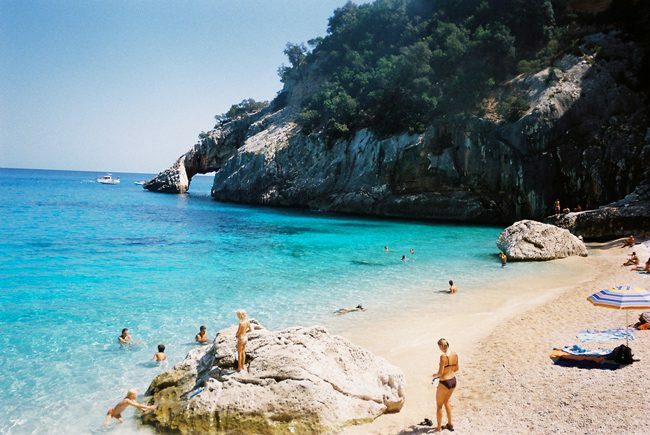 Cala Goloritze is one of the most photographed beaches in Italy. In this particular beach, boats must anchor in a designated area away from the beach and swim to land. This is a perfect opportunity to put that mask and snorkel on and see for yourself just how clear the water is. If the sea is calm and you pause for a moment, you might think there’s nothing between you and the sandy seafloor 30 meters below. Once you make it to the beach, be sure to spot the arch on the southern end of the beach before swimming back to the boat for a round of fresh fruit and a cold drink. Pro tip: it is possible to hike to Cala Goloritze via a marked trail from Cooperativa Goloritze (approx 3 hours return). Another stunner, Cala Mariolu is a good spot for a picnic lunch since you can drop passengers and gear at the beach and anchor the boat in a designated area at sea (which means the driver will need to swim back if you rented your own boat – no big deal really). The beach is split into two sections by a collection of large limestone boulders and instead of sand, tiny pebbles melt between your toes and literally slide you down to the crystal clear waters of the deeper end. There’s slightly more beach real estate here than at Cala Goloritze and even though it can get a bit crowded, you don’t want to miss splashing in Cala Mariolu and taking advantage of the shade provided by the looming limestone cliffs which you pretty much lean on. 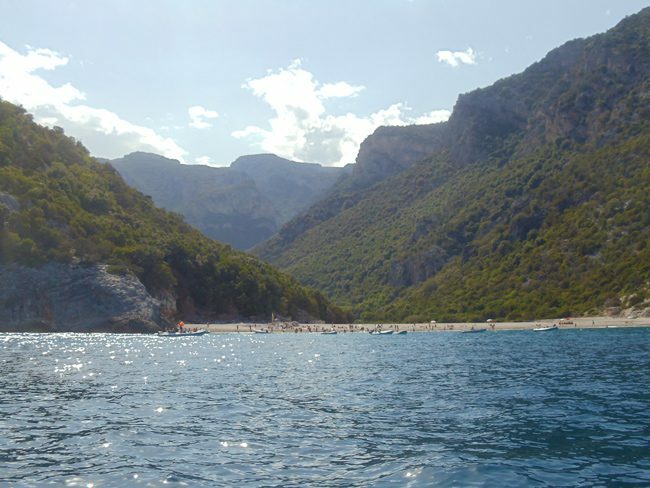 One of the larger beaches in the gulf, Cala Sisine is backed by a wide valley and boasts a mix of sand and pebbles. 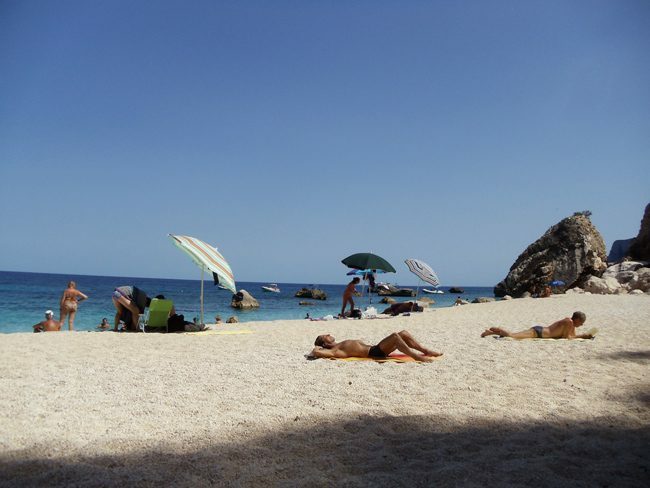 Cala Luna is one of the more popular beaches in the gulf and is serviced by large tour boats that drop bucket loads of tourists in succession. 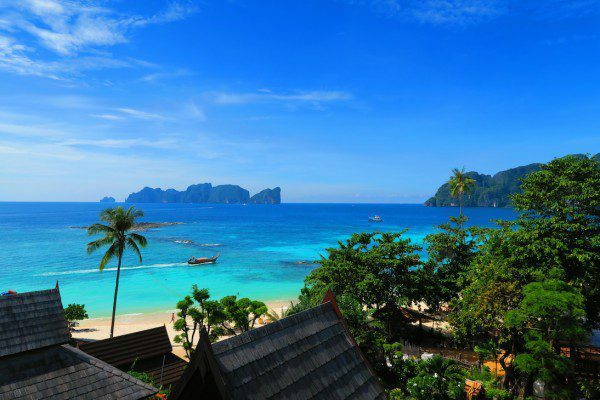 It’s the widest beach in the gulf, backed by an impressively wide ravine and blessed with clear waters that make for an interesting snorkeling excursion. 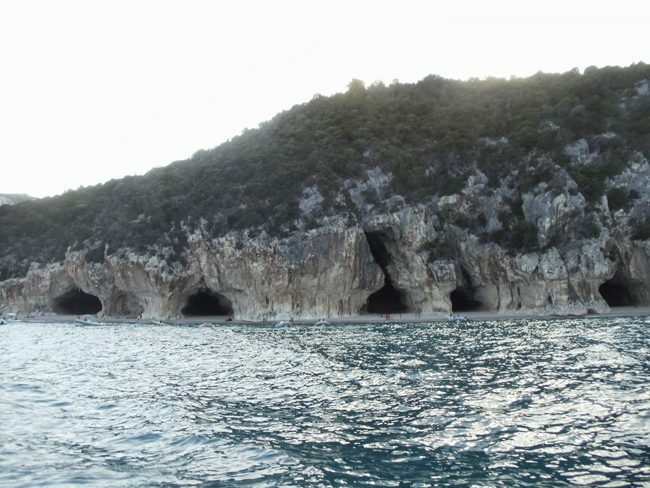 On the way back to the Orosei marina, you can closely inspect the series of limestone caves known as Grotta del Bue Marino and if there’s any extra time left, you can park it in Cala Gonone and go for drinks. Despite the slightly rough voyage back to the marina, the feeling of absolute freedom on this day, combined with gulf’s natural beauty is something we’ll never forget. Looking back, we wish we had an extra day to spend in the harder to reach beaches. This is a stunning part of Sardinia. You’ll likely be exhausted after this active day in the sun. After dropping the boat off, go for a quick meal in the village and head back to your accommodation to rest and to reflect on this special day. The last day in the Gulf of Orosei can be spent in a number of ways but basically, the main focus will be on exploring the majestic limestone mountains that make up the Gennargentu range. This area is blessed with deep cave systems, grand canyons, ancient settlements, and tough “country folks” that in the past included escaping bandits. 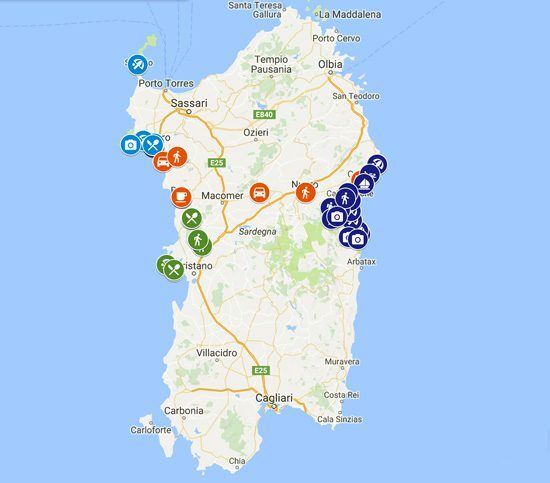 Here are a few ways how to spend this sixth of 7 days in Sardinia: (1) go scuba diving in underwater caves and explore WWII wrecks (2) head back to the beaches of yesterday or hike to Cala Goloritze (3) hike to the massive cave which houses the Tiscali archeological village – about five hours return (4) hike the Gola su Gorropu – a.k.a the “Grand Canyon of Europe” – via a trail along a gorge squeezed by 400m-high cliffs (5) go on road trip to explore the region with a possibility to combine with #4 if there’s time and if you got an early start. We personally went for option #5 and though we did not have enough time to hike the canyon, we’ll stop for a scenic break right next to the trail head. 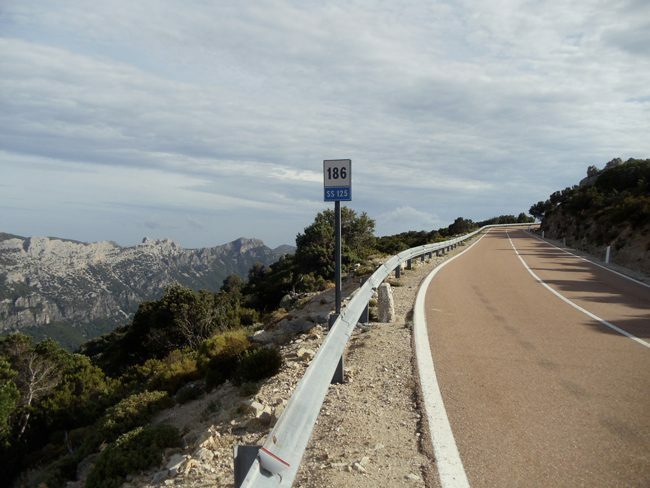 From Orosei, drive on the scenic SS125 mountain road in the general direction of Santa Maria Navarrese. The return journey is 160 km (~ four hours) but you can stop and turn around at any point. This “highway” slices through the mountains and passes beautiful country scenery where farming communities and small towns cling to the mountains overlooking the sea. 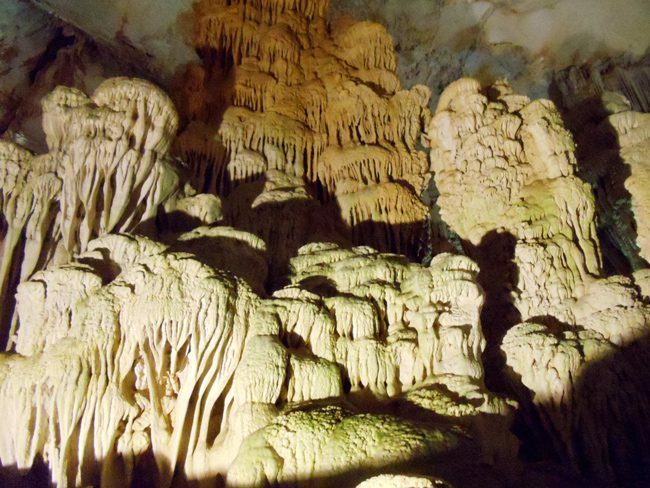 You can’t say you’ve been to Sardinia until you’ve visited one its limestone caves. In the Gulf of Orosei, you have the chance to see the world’s second highest stalactite column (38 meters) at Grotta di Ispinigoli. Just before the village of Dorgali, descend 280 steps into the massive underground vertical chamber for a tantalizing feeling of entering an abyss. 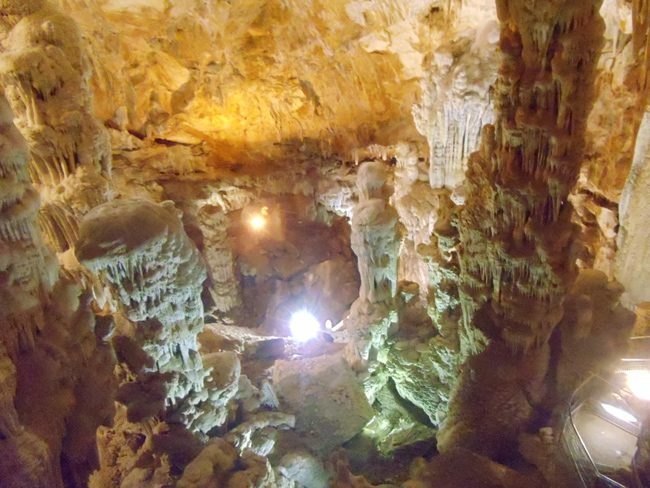 The large chamber springs full of curious formations carved over millions of years by the elements into the limestone rock. You can also peer down towards a second chamber way below that’s named the Virgin’s Abyss. Excavations have found bones and various artifacts including jewelry implying this was sacred to the historical residents of the area. Entrance to the cave isn’t cheap but it sure is recommended though photography is not allowed, so you’ll need to take covert shots. 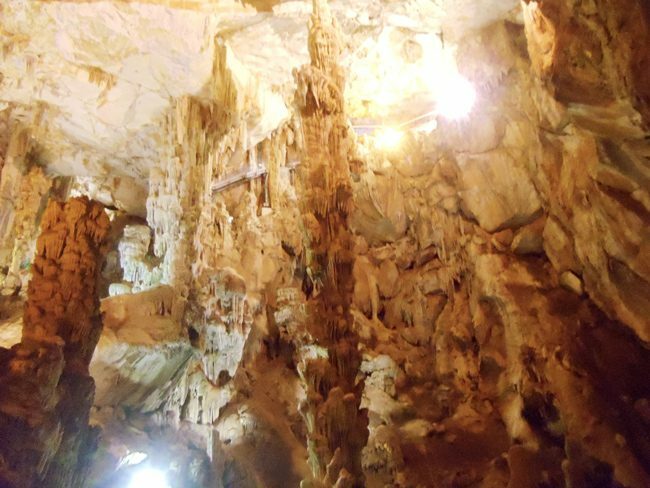 About a 15-minute drive from the limestone cave, Dorgali is a scenic town whose main exports are its breathtaking scenery and crafts. Stop here for a quick stroll, pick up a few souvenirs, and treat yourself to a cold drink. Take the tunnel from the SS125 and literally slice beneath the mountains to the laid back fishing village turned resort town of Cala Gonone. 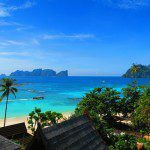 This picturesque holiday village is a good place to base yourself at and it is from here that chartered and organized tours depart for the gulf’s beaches. 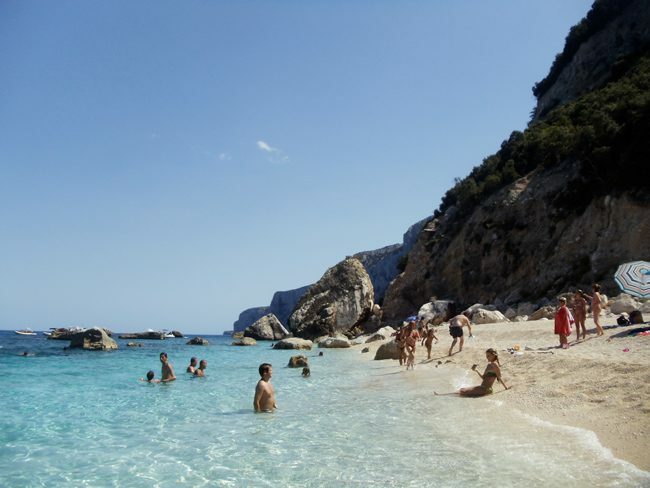 The town literally leans against the huge limestone mountains and if you’re just passing by, Cala Gonone is a good place for lunch, drinks, and a quick swim. Note that it is not worth stopping here on the way back (unless for dinner) as the sun will have already set beyond the mountains. 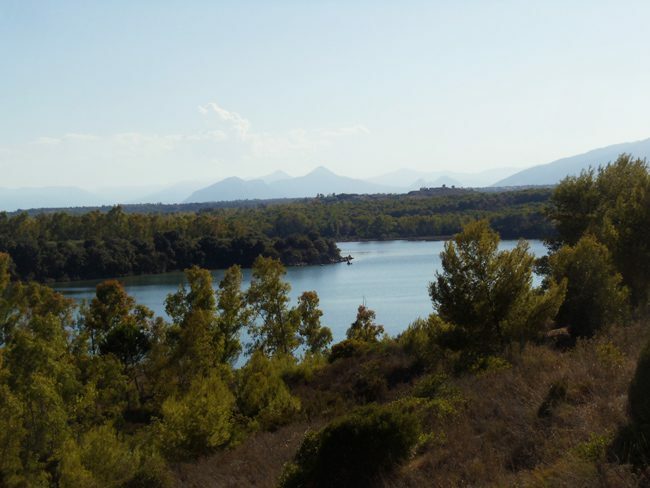 Continue the drive on SS125 for a few more kilometers until you reach B&B I Delfini. 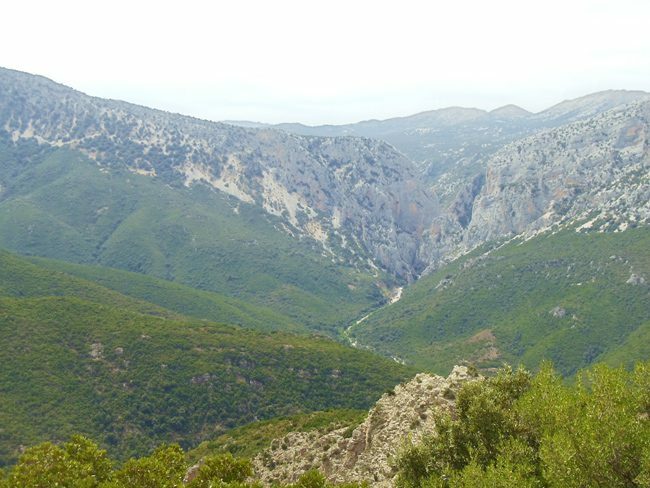 Park the car and take the short path to an excellent viewpoint down to Gola su Gorropu – known as the ‘Grand Canyon’ of Europe. 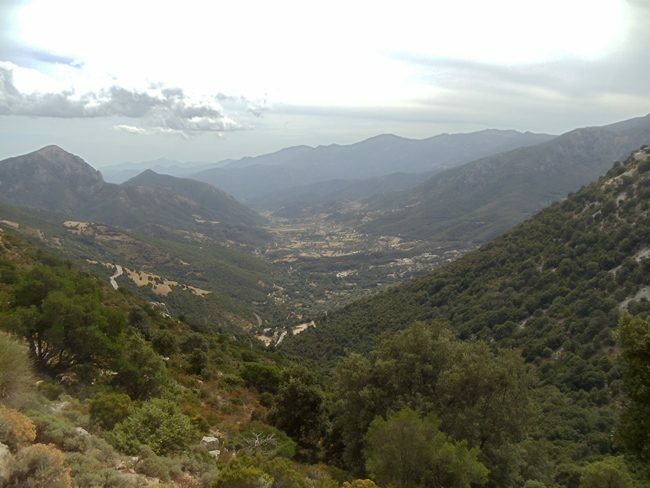 It is from here that you can pick up the ~3-4 hour trail to the famous gorge or simply admire the views from the top. There are various other lookout points towards the gorge along the way and you’ll easily find them. From here the road continues to snake its way along the mountains leading to a desert-like plateau where sheep easily outnumber humans. This section of the road is seriously scenic and you’ll be making frequent stops to digest the views and gather your thoughts. 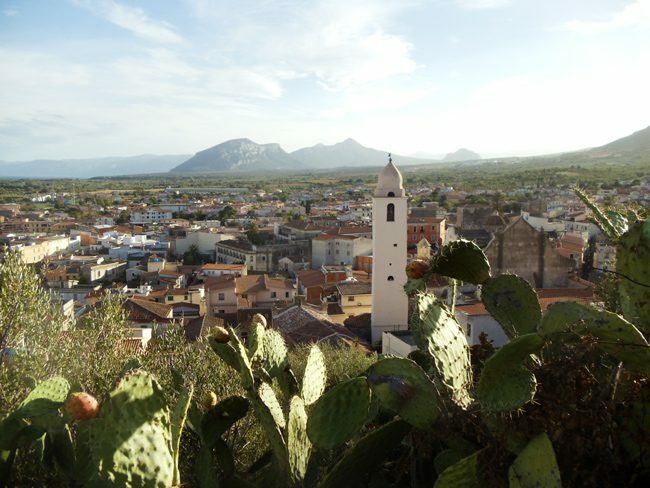 A pleasant and an off the beaten track stop is in the village of Baunei. There’s not much happening here aside from awesome views of the fertile valley meeting the bay. We decided to try our luck and take a detour up the mountains following the signs to Il Golgo / Su Sterru. 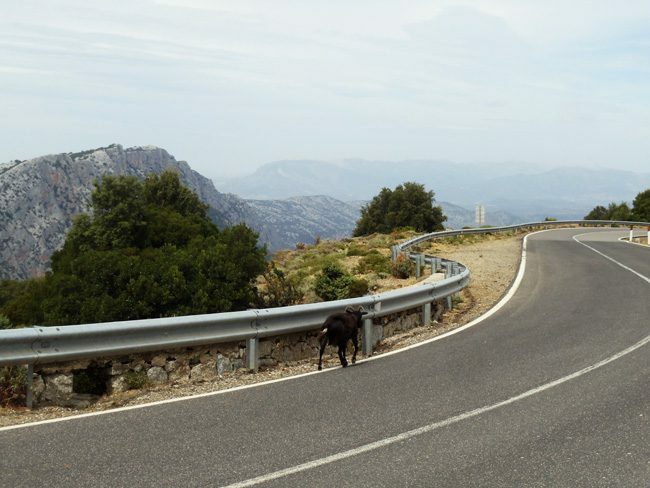 The twisting road is very steep for the first few kilometers but offers excellent stops for spectacular panoramic views. A few slow-going kilometers later, the road leads onto a strange-looking plateau. There’s very little here aside from sheep, donkeys, and lots of pine trees. After a while, the paved road turns into gravel but you can manage with a regular 2WD. Follow the impromptu signs to Il Golgo and don’t be afraid if you’re the only ones here as very few tourists venture up here to get off the beaten track. The Il Golgo is a fascinating 270-meter near perfect round sinkhole. It is one of the largest in the world and you walk around while peering down into the abyss. It’s impossible to see what’s actually happening down there but the journey getting here coupled with virgin scenery is what makes the visit worth it – though not an absolute must. And speaking of virgins, there’s a remote church not too far away from the sinkhole that you can pay a visit to. 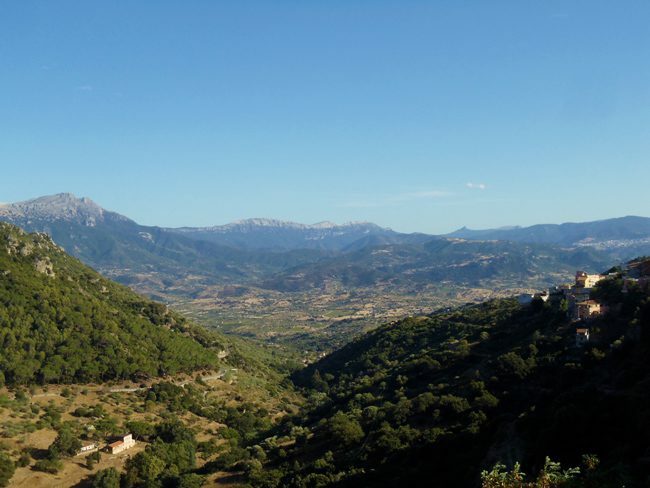 On the way back down, we paused in the village of Baunei to walk around and enjoy the views from one of its cafes. At this point, we decided to head back in the direction of Orosei as we had made dinner reservations. To wrap up the most special part of our week in Sardinia, we made dinner reservations at a romantic restaurant that has unfortunately shut. The good news though is that on the way back to Orosei, you can still enjoy a romantic dinner near the cave we visited earlier in the day. Be sure to make reservations at Ristorante Ispinigoli, which also doubles as a hotel. 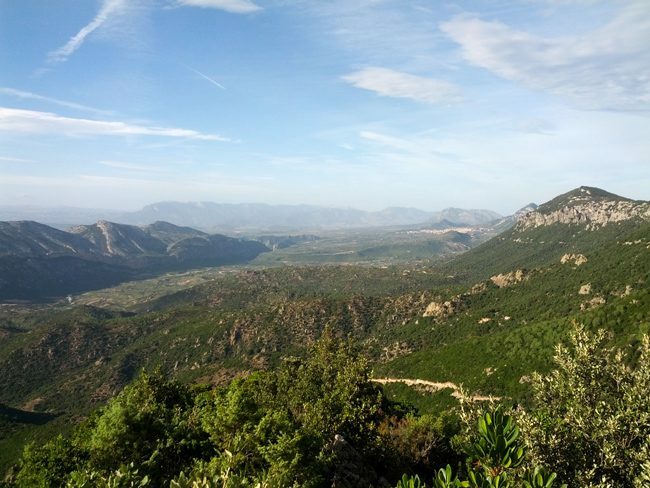 The final day of this 7 days in Sardinia itinerary takes advantages of the highlights in and around the Sinis Peninsula as part of a road trip back to Alghero in preparation for tomorrow’s departure. Pro tip: instead of driving back to Alghero via the Sinis Peninsula, you can head north from Orosei and swing west to Alghero via the glitzy Costa Smeralda. The northeast section of the island is blessed with a number of seriously stunning beaches (Cala Brandinchi, La Cinta Beach) but also with people trying their best to look stunning. If there’s time, you can also explore Capo Testa before heading to Alghero (total driving time without stops is approx 5 hours). 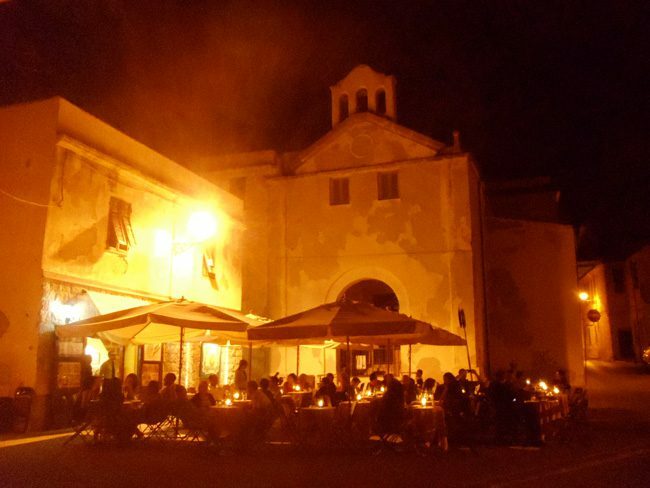 To maximize your sightseeing time and still leave a few hours for shopping and dining in Alghero, link with the SS 131 which is a major highway connecting Nuoro with Oristano. Driving time from Orosei to Oristano should be around 90 minutes (~125 km). From Oristano, it’s another 20-minute drive via the SP1 and then the SP6 to the Sinis Peninsula and the settlement of San Salvatore – our first real stop for the day. If you’ve ever seen “the Good, the Bad, and the Ugly” or any other spaghetti-western film, you must pay a visit to San Salvatore. This tiny settlement was used as the set for many films in the genre, a collection of dusty-looking houses facing a large inner courtyard. During the summer months, a small crafts and food market greets curious visitors and during late August the whole place really comes to life in a nine-day festival. Be sure to check out the town’s sacred church which is built on the grounds of an ancient well. 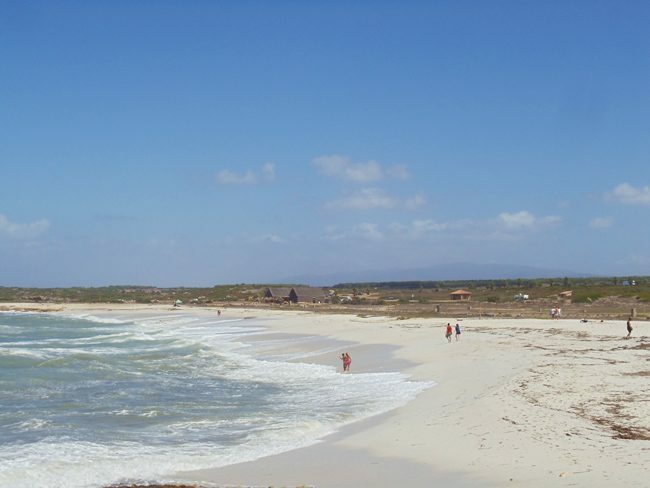 A 15-minute drive from San Salvatore brings you to Is Arutas Beach. 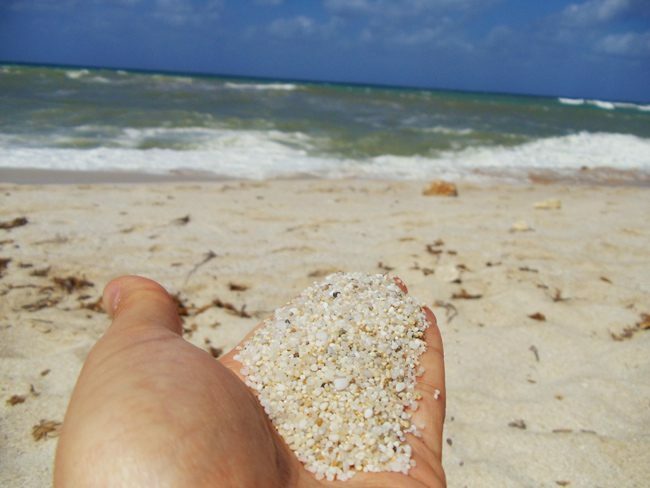 It may not have the blue colors of other beaches we’ve seen so far but Is Arutas has some of the strangest sand you’ll ever step on. In fact, it’s not really sand but rather quartz pebbles that cover this unique beach. If you had an aquarium back in the 70’s or 80’s, there’s a good chance the pebbles in it came from Is Arutas though their removal from the beach has been prohibited for many years now. The beach itself is wide and long, and the quartz pebbles make it a must-see for beach lovers though swimming conditions might be rough. If you’re feeling like having lunch now, head to Agriturismo Su Pranu – a working farm with a highly-acclaimed restaurant (check opening hours). 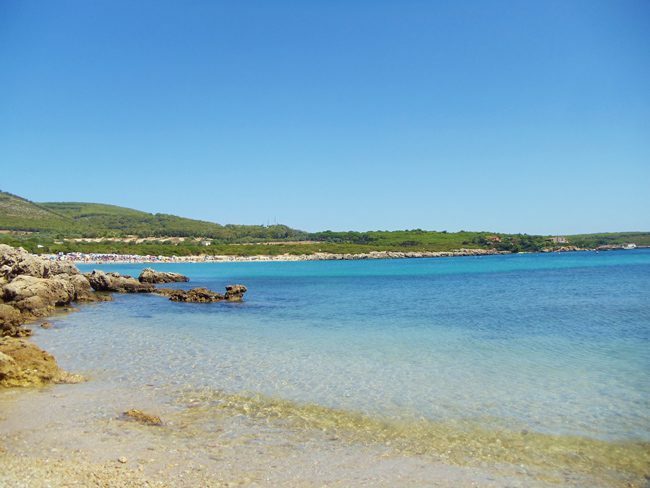 We’ll start heading north to Alghero but make a few stops in charming hilltop villages, the first of which is Milis (approx 40 minutes from Is Arutas Beach). 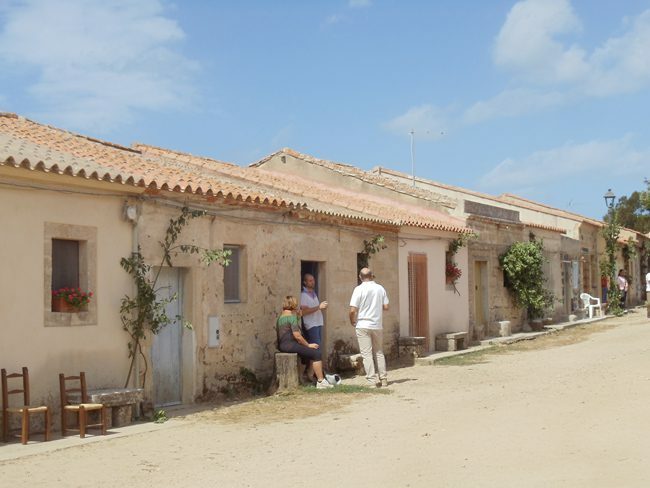 Milis is quite a well-kept villages and is famous for its orange groves. Park the car in the center of the village and check out the main piazza and old churches before moving on. 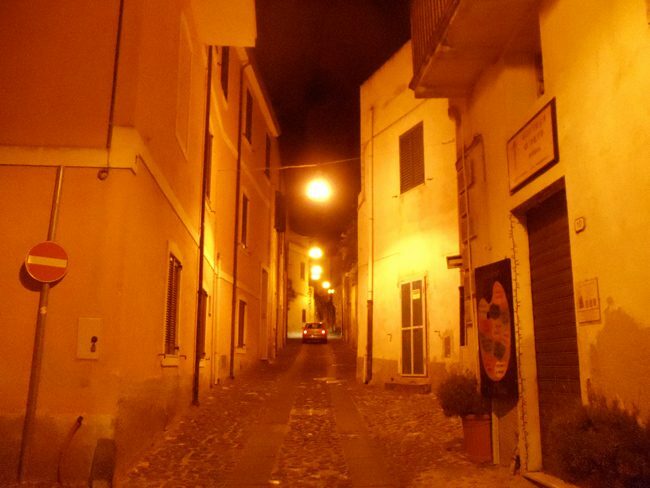 Cuglieri is a village where time barely moves, a hilltop charmer with sea views. Check out the Basilica di Santa Maria della Neve which is famous for its silver dome and breathtaking panoramic views of the mountains and the sea. 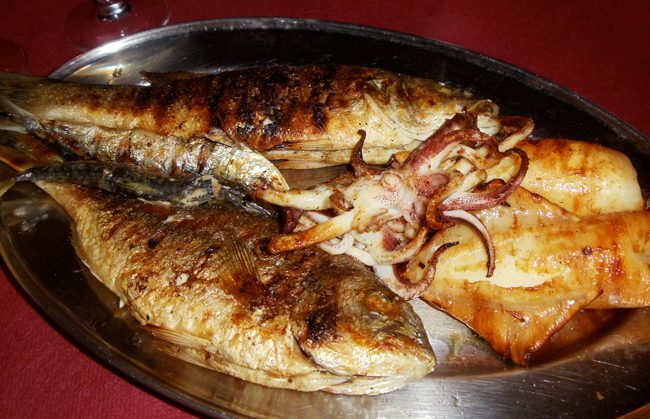 The village is also home to a fine and unpretentious Sardinian restaurant worth checking out. 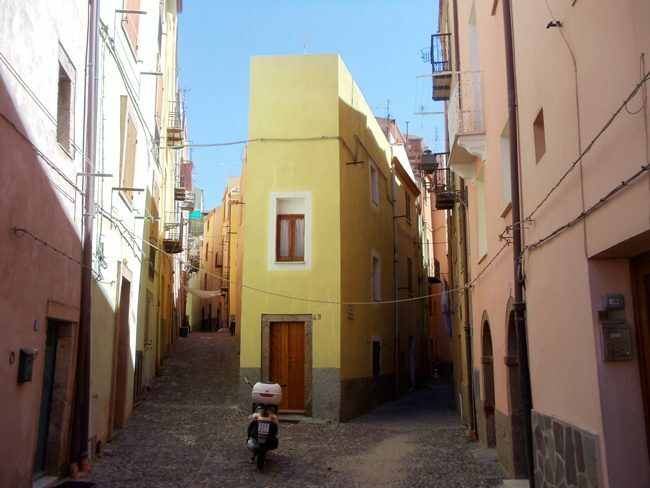 Hiding in one of the village’s steep alleys, ask around for directions to Trattoria Desogos. 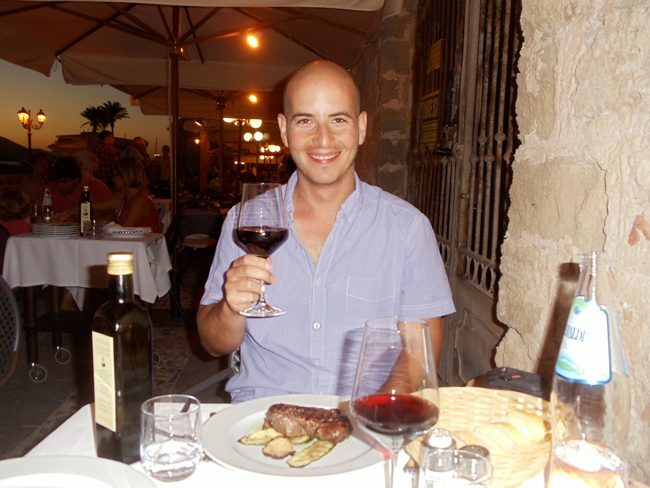 The food comes fast, you’ll be dining with the locals, and the antipasti, wine, olives pasta and meats are super yummy! It’s about a 90-minute drive from Cuglieri to Alghero. Back in “the big city”, revisit your favorite spots from the first two days and perhaps pick up a few local items to take back with you (see recommendations from day 1). For dinner, head back to the piazzas of the historical center for pre-dinner drinks and one last pizza and a last sniff of la dolce vita! 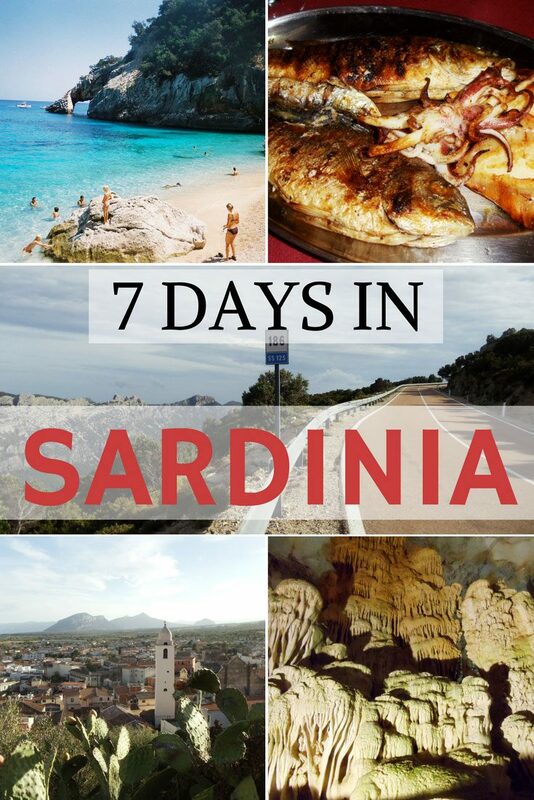 I hope you’ve found this 7 days in Sardinia sample itinerary useful in planning your adventure. A week in Sardinia is the optimal time for getting a taste for this amazing island destination and you’ll surely return here for another summer in the sun. 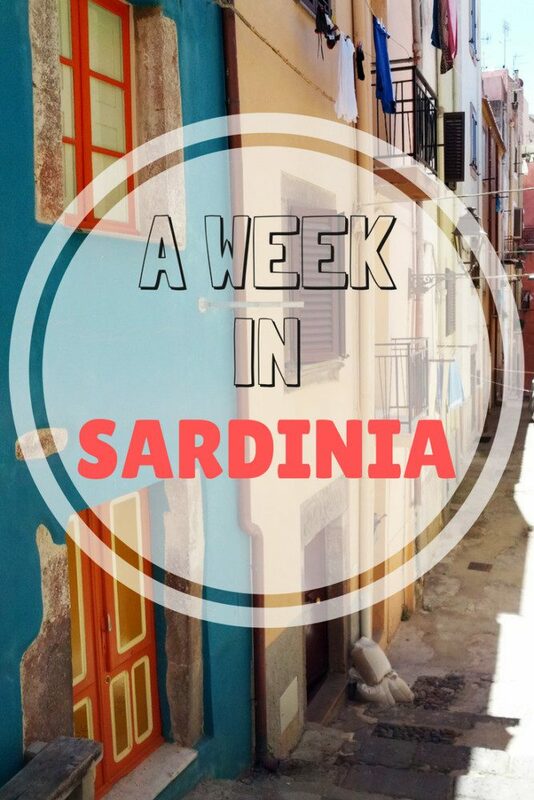 Be sure to also check out this list of the top 10 things to do in Sardinia.